SoftPlanet makes it possible for everyone to get free nLite download directly from our servers. There is no registration needed for downloading. The installation of the Windows operating system is a somewhat complicated process that has some irritating sides. For example developer Microsoft adds a lot of components as an integrated part that can't be removed unless you use a special program after the installation process. But if you want to remove components like Internet Explorer or Windows Media Player prior to the installation process you can do it now with nLite. This app will configure the installer of Windows in many ways and it will do it for no price, because it is free. You can also download it in a fast pace, because its installer is very small. nLite is some kind of a wizard, which does its magic and removes all these unnecessary Windows elements once and for all. You just need to have the Windows installation CD and you are ready to go. Maybe most of you know that there is another possibility to delete these components - by using the Control Panel. However it is really irritating to perform this action every time, when you re-install your PC. That's why the developers came up with the idea to create something, which can solve this issue once and for all. nLite is the perfect example of such a solution. 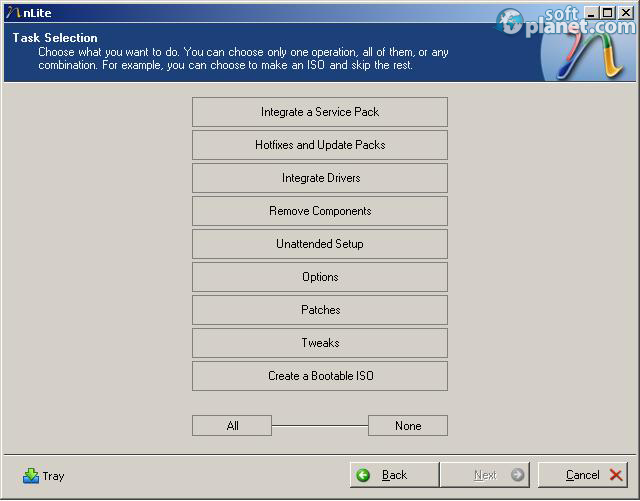 This application allows you to also integrate updates, drivers and hot fixes into the current ISO or just create a bootable image. In order to do all this you need to set up an un-installation mode – enter a user name, a product key, a screen resolution, a desktop theme, etc. As you might notice by now, this very smart software requires more advanced computer skills. Even its producers recommend nLite to be used only by computer-savvy users. However the producers provide their users with useful tutorials in English, Czech, German, Bulgarian, Italian, Japanese, Polish, Russian, Serbian, Slovak and Spanish. During the installation process you can add more languages than English and if you do it you will make the app multilingual. If you choose that the app will give you a choice among a lot of languages for the interface of the app. This choice is done during the setup wizard that starts when you use the application for the first time. Then nLite proceeds with the second step, which includes localization of the Windows installation files. For this part you need to choose the folder that contains the “i386” or “AMD64” directory and the rest of the Windows installation files. Here the app reminds you that it works only in a pre-installation environment. If you are looking for an alternative installation pack for the Windows 7 and Windows 8 operating systems you should stop searching, because nLite will create the installer that you need not like someone else did it, but in the way that you want it to be. The program works without any problems and it offers one more utility that you will deem worthy of using. It can create a bootable ISO file that can be used to start the installation procedure. In this way you can fix some installers that are not bootable, which may cause a lot of problems if you want to install Windows from them. The best feature of nLite is that with it you can make your perfect installer for Windows. Then you will not need to create different installers and you will save time, because with it you can add drivers, fixes and other components you want to have in your operating system. Also you can remove apps that were added by the developer in the system if you don't want to have them. And last, but not least, the app is totally free. Our security scan shows that nLite is clean from viruses. The current version of nLite has been scanned by our system, which contains 46 different anti-virus algorithms. That ensures that nLite 1.4.9.3 is 100% safe for your computer.